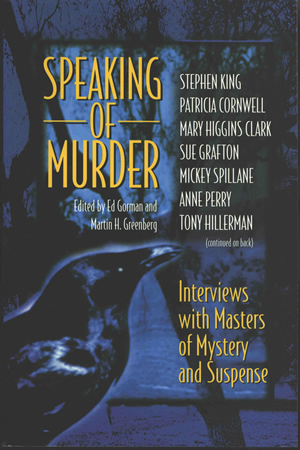 This is Speaking of Murder: Interviews with Masters of Mystery and Suspense, edited by Ed Gorman and Martin H. Greenberg and published in 1998 by Berkley Prime Crime, an imprint of the Berkley Publishing Group and a member of Penguin Putnam Inc. The book contains interviews with many mystery authors in addition to Tony Hillerman, such as Stephen King, Patricia Cornwell, Mary Higgins Clark, and Sue Grafton. The cover design is unattributed, and features a background of tree silhouettes on a purple ground and the head and upper body of a raven or crow, in shades of black, blue and purple. The front cover text has the book title and subtitle printed in yellow, with the editors' names and a partial list of contributors printed in white. On the back cover, the list of contributors continues in yellow along the spine, while white text gives a synopsis of the book with bulleted mentions of content by particularly well-known authors. The back cover background is blue and the bar code is in the lower right corner.